Short walk in Gunpowder Falls State Park one morning and happened to look at a tree that I've hiked past a few times. The tree seems to have eaten most of the sign (that probably said "Weapons Prohibited"). 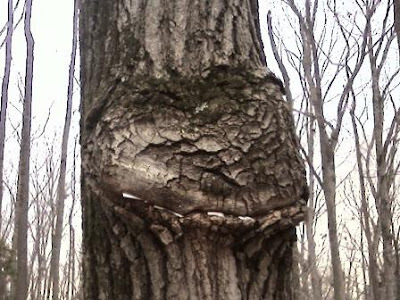 A bit further down the trail, another tree. This one looks like it has eaten the entire sign but for a few crumbs. 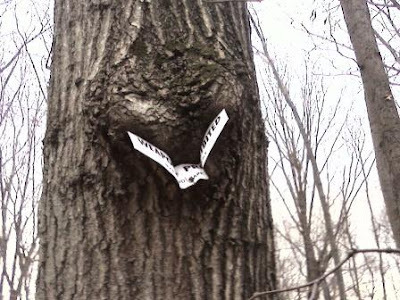 The crumpled sign on the first tree reminded me of the stylized peace sign dove. The Edward Spath (my Dad) academic achievement award is presented each year to a consumer of services at the Maryland Workforce and Technology Center, formerly known to us as the Maryland Rehabilitation Center. This year's award  is presented to Charlotte Diane Thompson. Charlotte was referred to DORS in July 2003 for a Physical Therapy evaluation and a comprehensive career assessment. Charlotte had a successful career as a chef but could not continue in her career due to limited mobility with arthritis in both knees. Charlotte began receiving academic services in 2005. She was taking online courses through University of Maryland University College (UMUC) toward a journalism degree, and at WTC she was proctored by staff in the academic unit for her exams. In her other courses Charlotte was doing well, but she put off taking the math classes she needed. Charlotte demonstrated math anxiety and would forget simple steps in solving problems. At times she would become so frustrated that she would "blank out" on the math and would not be able to do basic calculations. Transportation and other health issues presented some problems, but Charlotte didn't let them slow her down. She was determined to pass these courses. She would come in early and would come in on nonscheduled days for extra tutoring time. Charlotte took advantage of whatever help was available, including using the CD-ROM that came with a textbook and emailing her online instructors at UMUC. She participated in one project for extra credit. Charlotte also spoke with the students in the MAST program here at WTC about not putting off difficult classes. Charlotte passed two courses in algebra and one in finite mathematics. She continued to take courses for her journalism major. She will receive her degree in May 2009 with the goal of becoming a writer for a food magazine, thus incorporating her previous career knowledge and her degree. Charlotte is now working with job placement. She is a wonderful example of someone who knows what she wants and perseveres to reach her goals. Her rehabilitation team includes Lynette Whalen and Milton Bell, field counselors from the DORS Park Avenue Office: administrative specialist Joy Young; vocational evaluator Ava Shener, physical therapist Joy Nemerofsky, occupational therapist Ann Reed; RTS staff Ann Krout, Helene Dubay and John Arthur; case managers Therese Parr and Dinah Chavez; and myself as academic instructor. It is a real pleasure to present the 2008 Edward Spath Academic Achievement Award to Charlotte Diane Thompson. This is the first time I've won anything, and believe me, it is greatly appreciated. I would like to personally thank Ms. Parr, Ms. James and the academic team here at DORS for all their help and support, and for nominating me for this award. It has been quite the journey for me. It was the pushing, prodding and determination of Ms. Melissa James that allowed someone like me to complete my degree. I knew it wasn't going to be easy, but with her help, I was able to succeed. I would also like to thank Ms. Therese Parr for proctoring my examinations. So often, she was the kind face that eased my nerves. All of the ladies of the academic team are an asset to DORS, and should be applauded for their hard work. I would like to thank all of my counselors, past and present who worked so diligently to make sure I had all of the tools, tangible and intangible to succeed. A special thanks for Ms. Joy Young who assisted Ms. Whalen. She is an unsung hero who should also be recognized. Finally, I'd like to thank the family of Edward Spath for establishing this award in honor of their loved one, and all of the staff of the Workforce and Technology Center. You all have been very kind to me, and I thank you. 2009 (the 2008 Award ceremony) was the first year that my Mom missed attending the ceremony, due to an ice storm that week. I was able to attend, get photos and movie clips, as well as let Charlotte, Melissa and my Mom chat on cell-speaker-phone. "Edward Spath was a retired Baltimore City public school teacher and principal as well as a well-respected WTC academic teacher." Several days ago, I started following Todd Schuler on twitter, or toddlschuler as he's now known. He's the first Maryland State Legislator I've found there, and still the only one I'm aware of. There may be more, so let me know if you find any. As he represents the next district over from mine, I can't quite call him one of my elected officials. However, he had under 2 dozen followers when I found him online, meaning my voice was one of the very few live voters. And he certainly works with the delegates from my district, making this more than a random social contact. LatterDay_Scout: @jspath55 not my state, but I'll follow to help out. Is he dem or rep? "MSA" is the Maryland State Archives, the official record keepers, so I'd assume anything stored on their site is subject to Freedom Of Information rules. More on State information systems, or as Dilbert calls this trend "preventers of information services", below. "Facebook has been banned on General Assembly computers. Twitter is now the only real time source of Annapolis news." keithwalmsley: @toddlschuler Delegate- something must be done - its a legitimate avenue for dels and constituents to reach each other! bcoyle73: @toddlschuler That is bogus banning Facebook. Will that mean Twitter could be next? jspath55: RT @toddlschuler Facebook has been banned on General Assembly computers. Twitter is now the only real time source of Annapolis news. JaneSFarrell: @toddlschuler Good story last night on WUSA9 about the MD Gen Asmbly ban on facebook/myspace. What the Sun omits is the Twitter aspect of this - the Facebook/MySpace ban started yesterday morning, and I found out about it on twitter that afternoon, before the local TV news (Early or Late), and before the papers. The focus of the stories, as is typical from most local news spins, is the dangers of viruses, security breaches, the usual "if it bleeds it leads" nonsense. No excuse for preventing constituent communications to say you aren't on top of your information technology. Not sure how this will turn out, but Todd is now up to 30 followers. Keep up the democratic process, thanks.